This review contains spoilers for all four episodes of Gilmore Girls: A Year In The Life. A couple of Saturdays ago, my Mum and I sat down with a large pizza, a bottle of wine, and Gilmore Girls. I could barely contain my excitement. Eight years after the original series had wrapped up, we would get to see our favourite characters all over again – laugh with them, see ourselves in their choices, and marvel at their ability to consume large amounts of junk food and coffee. It had been too long. The much anticipated Netflix revival was nothing like I had expected, and in some ways quite different from the original series. Our beloved quirky characters came to life again, but feature-length episodes offered the chance to take things slower. We saw the Gilmore girls in higher definition, both literally and in the sense that their flaws became magnified in these film-like episodes. Things weren’t as sugar coated as they once were. Reviews have been mixed, but as a fan I found a lot to like. 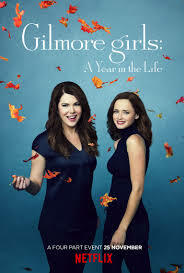 The first and last episodes (‘Winter’ and ‘Fall’, written by the show’s original creator Amy Sherman-Palladino) were definite highlights. Amy’s episodes were interesting, funny, and heartfelt, while those in between, written by Daniel Palladino, had too many time-fillers (like the Stars Hollow Musical). From the outset, the emotional stakes seemed much higher in the revival than they had ever been in the series. The characters are older, which seems to make their choices more significant. A large part of the revival’s narrative arc was the aftermath of Richard Gilmore’s death, which each of the Gilmore girls dealt with in different ways. The original series never really explored the loss of a loved one in much depth, but the revival’s depiction of the many ways grief can change your circumstances and have a lasting impact on your life was one of its strongest elements. The character for whom this loss was most significant was Emily Gilmore (Kelly Bishop). Emily is mother to Lorelai (Lauren Graham), grandmother to Rory (Alexis Bledel), and now, widow of Richard. Throughout the revival, Emily experiences different phases of loss, trying to find her feet again until she realises that she doesn’t want to just carry on with her old life – it doesn’t exist anymore, because Richard isn’t there. From a feminist perspective, it was fantastic to see Emily’s character progress and change, and become not just a mother, grandmother, and wife, but a fully formed person in her own right. For Lorelai, her father’s death is the catalyst for a realisation that she is not satisfied. Her decision to “do Wild” worked both as a tongue-in-cheek nod to the ‘finding yourself’ trope in contemporary popular culture, and as a way for her character to progress. Of course, Lorelai has never been one for physical exercise, let alone in the outdoors, and she ends up finding her answer without so much as a night in a tent. While her story ends with a wedding, the sense of fulfilment she has at the end of the series seems to come from working through her feelings about Richard’s death and realising what she herself wants, rather than simply from tying the knot. And then there’s Rory. In the original series, Rory’s character began as the epitome of the “good girl”: serious about school, passionate about reading, and good at maintaining long-term relationships. This ebbed and flowed throughout the seven seasons, but she largely retained her high-achieving, superstar status. In the revival, at first she seems to be living the dream, travelling the world and getting published The New Yorker. It soon becomes clear that, career-wise, this might be as good as it gets, and life-wise, things are very messy. While many found Rory’s arc disappointing, I quite liked that she wasn’t so perfect anymore. It made her character more real, and exposed the way in which her high-achieving young adulthood might have set her up for disappointment. As Lorelai says in season seven when Rory misses out on an internship with the New York Times, Rory is used to getting what she wants. So who is she when she doesn’t? That it takes her some time to figure this out is perfectly believable. Her affair with Logan (Matt Czurchy) makes sense for her character in the context of her life at that moment, however wrong it might have been. For me, Rory embarking on writing a memoir and then finding out she is pregnant cleverly reflected both her original character and the complicated turns her life had taken. I also liked that she still didn’t ‘end up’ with anyone, but that the door remained open for her and Jess (Milo Ventimiglia). The revival wasn’t perfect, however. In the lead up to its release, many had hoped the show’s politics would have evolved with the times. It had always been a mixed bag: the central female characters and the focus on their lives make the show seemingly feminist, yet there was also frequent homophobic humour and a distinct lack of racial diversity. In the revival, as this Tumblr has so cleverly highlighted, what seem like attempts to address the issue of diversity backfired, with people of colour largely designated to the background. Insensitive humour was still present (of the transphobic and body-shaming variety), which seems beneath a show known for its witty banter. In 2016, one would think there are no excuses for a lack of diversity and sensitivity in making television, especially with a platform like Netflix, home of culturally diverse shows like Orange is the New Black. Ultimately, while the Gilmore Girls revival ticked many boxes for me as a fan, and did some things (such as the depictions of grief and the complexity of getting older) really well, its politics were as contradictory as ever. As much as I liked the revival, I can’t help but think that perhaps it is best if the show ends here, and we devote our attention to new, more diverse stories in future. This entry was posted in Film, TV and tagged film, Review, tv. Bookmark the permalink.